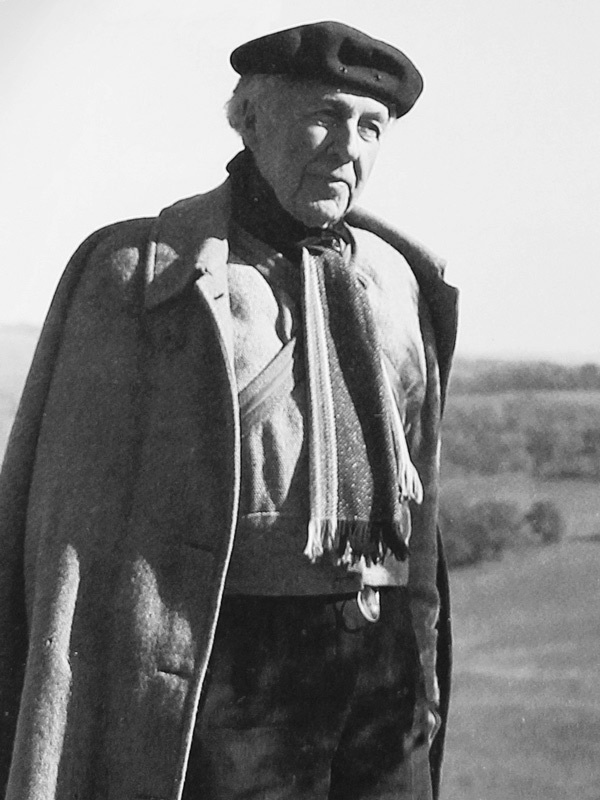 During his seventy year career as an architect, Frank Lloyd Wright created more than 1,100 designs, half of which were realized and a large portion of which came about later in his life. Wright was born in Richland Center, Wisconsin in 1867. He enrolled at the University of Wisconsin in 1885 to study civil engineering, completing only two years of the program. After working for Joseph Silsbee on the construction of the Unity Chapel in Oak Park, Illinois Wright decided to pursue a career in architecture and he moved to Chicago where he began an apprenticeship at the famed architectural firm Adler and Sullivan, working directly with Louis Sullivan until 1893. After parting ways, Wright moved to Oak Park. Working from his home studio, he developed a system of design developed from grid units and rooted in an appreciation of natural materials that would come to be known as the Prairie School of Architecture and would change the landscape of American design forever. Wright devoted himself to teaching and writing during the 1920s and 1930s. 1935 marked the beginning of an immense surge of creativity and productivity as he began work on his most celebrated residential design, Fallingwater. In the 1940s and 1950s Wright focused on his Usonian designs that reflected his belief in democratic architecture, offering middle-class residential options. In 1943, Wright took on his most demanding commission, the Solomon R. Guggenheim Museum in New York. The museum, which would open its doors six months after his death in 1959, would be called his most significant work.